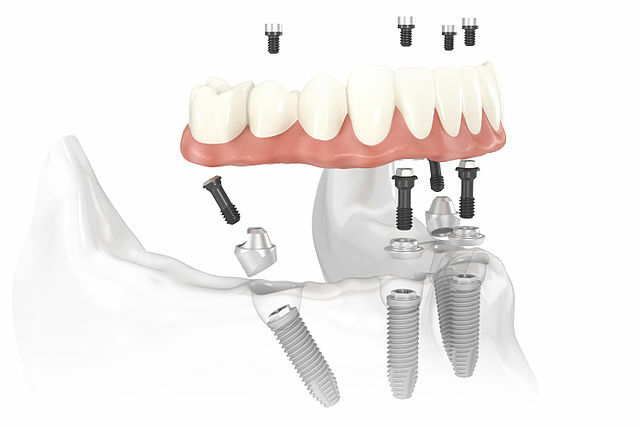 All-on-4 dentures supported by implements were designed to use just four implants to secure an entire set of dentures. Because they rarely require bone grafting, dentures supported by implants are a good option for patients with low bone density. Dentures supported by implants are completed in only one day. The four implants are placed to create a stable foundation for your dentures at locations where bone volume is the greatest. A temporary set of teeth are fixed in place the same day as the denture implants. These temporary teeth can be the patient’s new dentures or a current set that are fitted to the denture implants. The process of healing takes three to four months in total. When the denture implant has fulled integrated with the bone the temporary teeth will be replaced with the permanent set. Denture implants are less expensive than a single implant. Dentures supported by implants halt bone loss. After losing a tooth the bone immediately begins dissolving at the site. Implants stabilize the process and stimulate the bone. Denture implants give you the peace of mind that comes from not worrying about dentures slipping or clicking while you talk, laugh, or eat. Dentures supported by implants usually will not need bone grafts. Dentures implants have highly successful results in the long-term. Dentures supported by implants don’t require food restrictions so you can enjoy your favorite foods again. Dentures supported by implants are an great option for those who suffer from reduced bone density or a restricted budget. Denture implants offer quick results and have given our patients a huge difference in their quality of life. Implants recreate the function and security of natural teeth while also protecting your jaw structure. We accept insurance from many major dental insurance companies. Learn more about our options for payment.